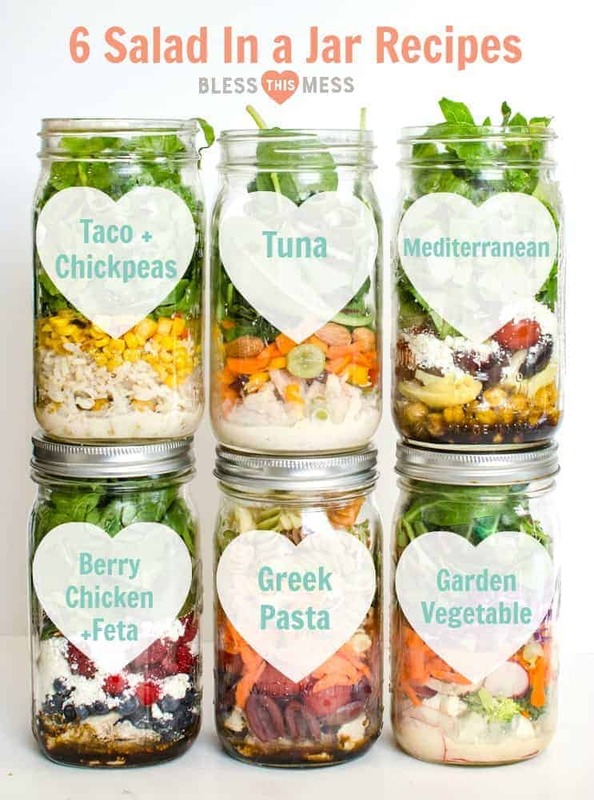 Life gets busy, but that doesn’t mean that daily salads are out of your grasp – prep a salad in a jar in advance, and you’ll eat well all week long! 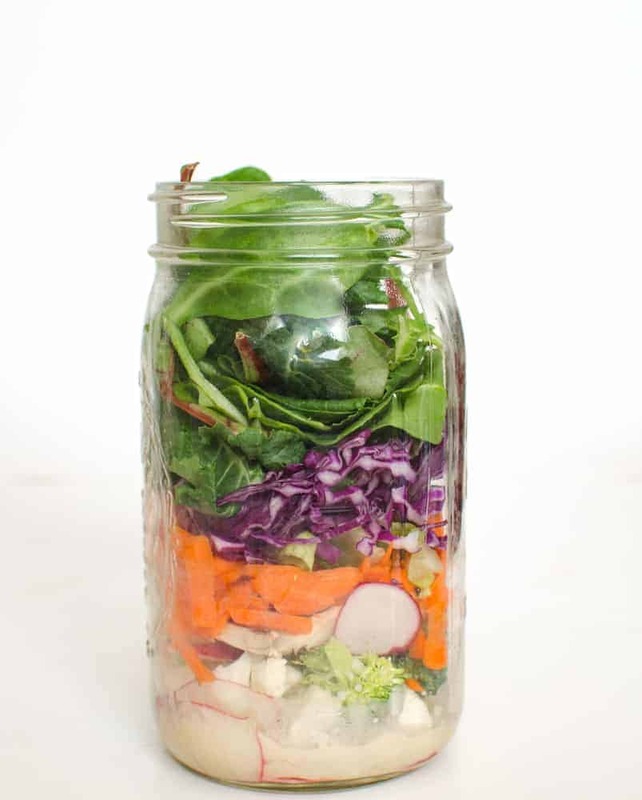 Salad in a jar is one of my favorite things, and I wanted to revisit them for you today. 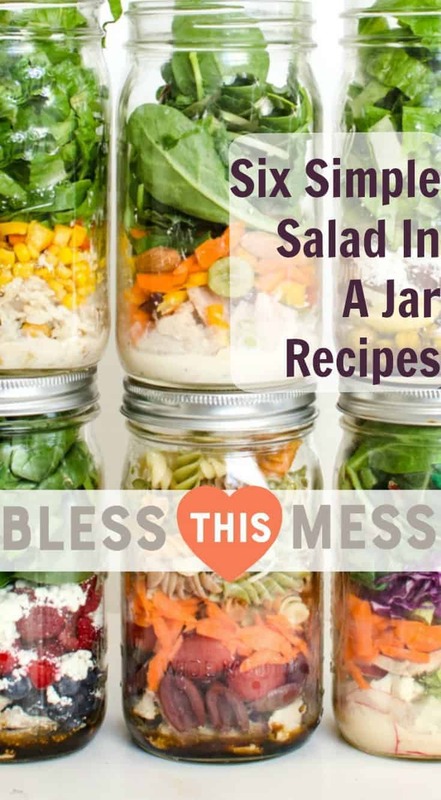 A few years ago, I wrote a big old post about how to make salad in a jar that contained all the basic how tos, tip, tricks, and recipes. Today I want to share some of those ideas again, along with some more recipes to add to our growing collection. What is the appeal of having a salad in a jar you might ask? Well let me tell you, friends! Not only does it last forever (the lettuce literally stays nice and crisp for well over a week), but the prep work is done and you have healthy eating right at your fingertips. Prepping a bunch of these one day and eating on them all week long is the perfect little help you might need to eat well. Life gets busy, and taking time to eat something beyond the quick and easy can get pushed aside. BUT if all you have to do is unscrew a lid, find a fork, and give a little stir, then there’s no reason to not be eating more salad. Plus, the jar is perfectly portable. Throw it in a lunchbox along with a boiled egg and an apple, and you have a delicious healthy lunch to go. Done. This time instead of just normal green salads in a jar, I also added a tuna salad in a jar and a pasta salad in a jar to go along with all those leafy greens. You are going to love these! Put the salad dressing in first. Add your protein, add your “fixins,” and then add your greens. No matter the recipe, placing your ingredients in the jar in this order is best. Keep the moisture of the dressing away from your lettuce and greens for best results. 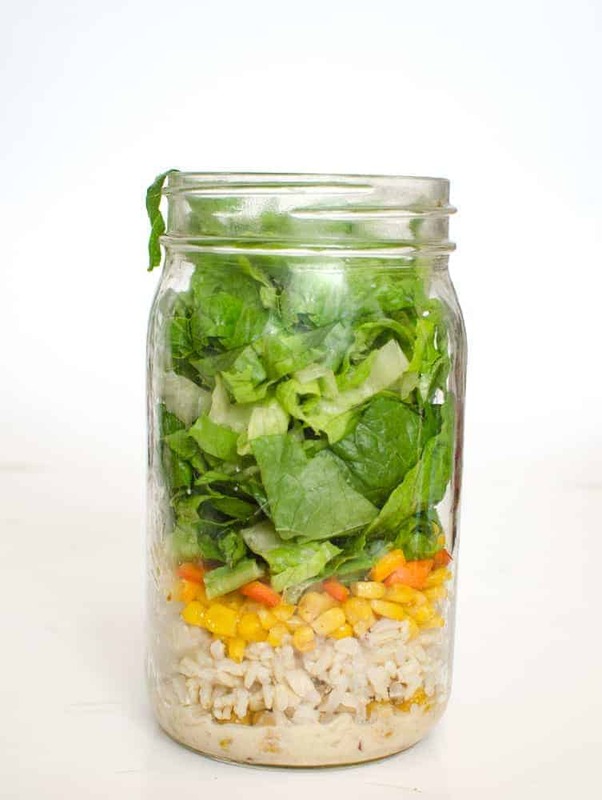 Salad in a jar can last 3-10 days in the fridge. 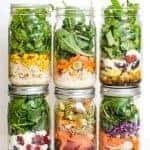 Three days for any salad in a jar that includes meat (eat those first) and up to 10 days for salads that have firm veggies and no meat. I like to keep things like eggs, cucumbers, and avocado out of my jar. I’ll add them when I’m ready to eat if I want them. Those things tend to get old the fastest. Homemade dressing is king. Don’t get in a rut though! Here are 9 of my favorite homemade salad dressings. These recipes only make about a cup too, so you aren’t stuck with tons and tons. Now you can try more kinds. I recommend the roasted garlic. It’s my favorite! The size of the jar will determine the servings. I like using wide mouth jars because they are easier to fill, eat from, and clean. 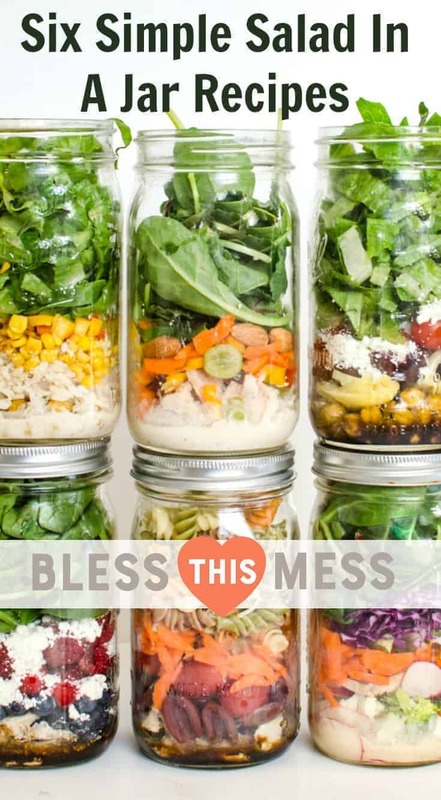 Use a pint jar for a lunch/single serving and use a quart jar for large dinner servings or a side salad for a family meal. All of today’s recipes are for a quart/large serving. 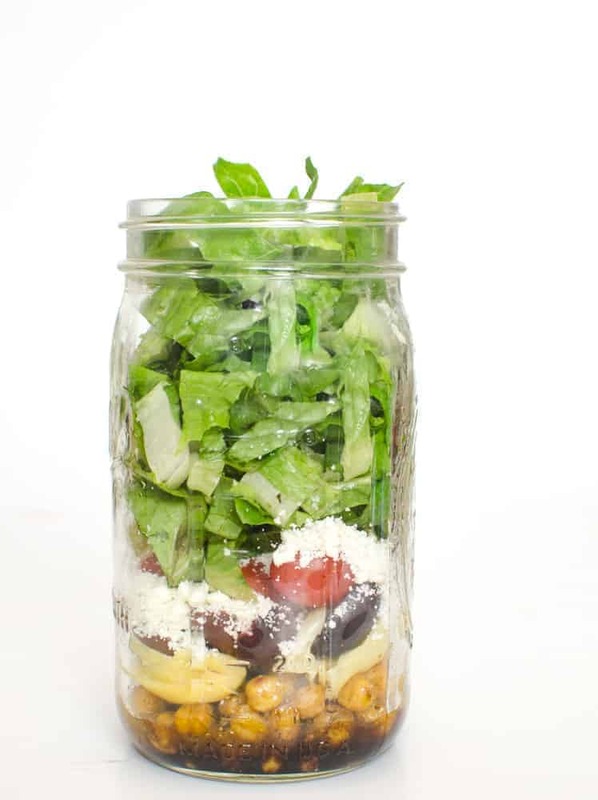 You can see an example of two smaller servings salads in a jar here. 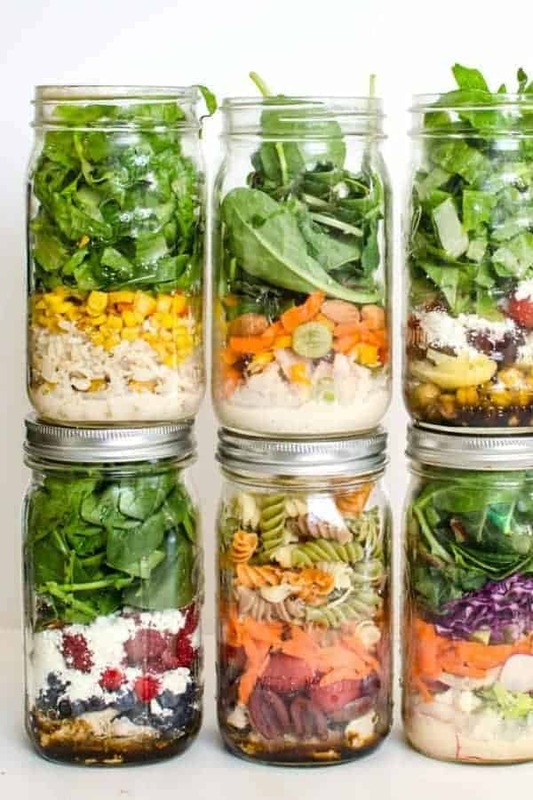 If you are new to salad in a jar, try making 2-3 of each size and see how you quickly you go through them. Why I love this salad: Spinach salad is always a hit in this house, and you can’t beat fresh berries, chicken, and feta. These classic flavors paired with a simple balsamic vinaigrette is forever a favorite. Note that because this jar has fresh berries and chicken in it, it won’t last as long as some other kinds of salad in a jar. I’d eat this within 3 days, if not sooner (if you are making a few kinds of salad in a jar, eat this one first). You can find the dressing recipe here and a recipe for great ways/tips for cooking chicken here. Place the dressing in the bottom of the jar. Top the chicken with the berries and then add the almonds and feta. 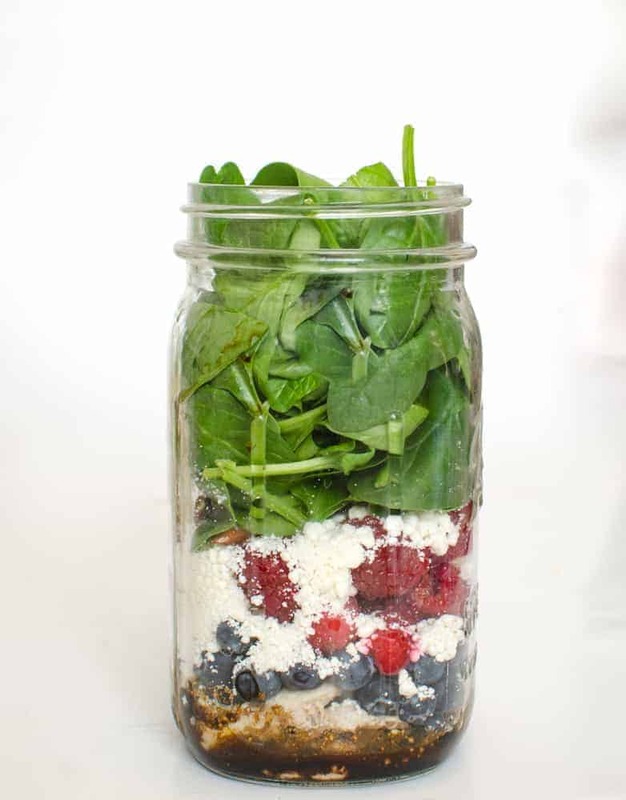 Fill up your jar with baby spinach. Screw on the two piece lid (flat and band) and store in the fridge for up to 3 days. I’d eat this within 3 days, if not sooner (if you are making a few kinds of salad in a jar, eat this one first). You can find the dressing recipe here and a recipe for great ways/tips for cooking chicken here. Why I love this salad: Because tacos never ever get old. I love this dish because I can eat tacos all day everyday and I always look forward to a little taco salad for lunch. This salad lasts a super long time in the fridge, at least a week, thanks to the lack of meat in the jar. We love roasted chickpeas and they are a great medium for a whole lot of flavor. Simply open a 15-ounce can of chickpeas and give them a drain and rinse. Then toss them with your favorite spices and salt and roast for 15-20 minutes at 400 degrees. They are delicious right out of the oven! I used the same chickpeas in this salad as I did in the Mediterranean salad, so I roasted the chickpeas in salt, pepper, cumin, and smoked paprika (just a hearty shake of each). These flavors went well with both salads. You can trade the rice for quinoa if you’d like and you can skip the corn altogether if you are watching your carbs, though I love the little pops of sweet. I like to add some chopped avocado or some sharp cheddar cheese on the day I eat it. You can find my ranch dressing recipe here. Add the roasted chickpeas, rice, and corn. Top the corn with the bell peppers then tomatoes. Fill up your jar with the lettuce. Screw on the two piece lid (flat and band) and store in the fridge for up to a 7 days. Simply open a 15-ounce can of chickpeas and give them a drain and rinse. Then toss them with your favorite spices and salt and roast for 15-20 minutes at 400 degrees. Why I love this salad: Because it’s different than the usual salad in a jar. 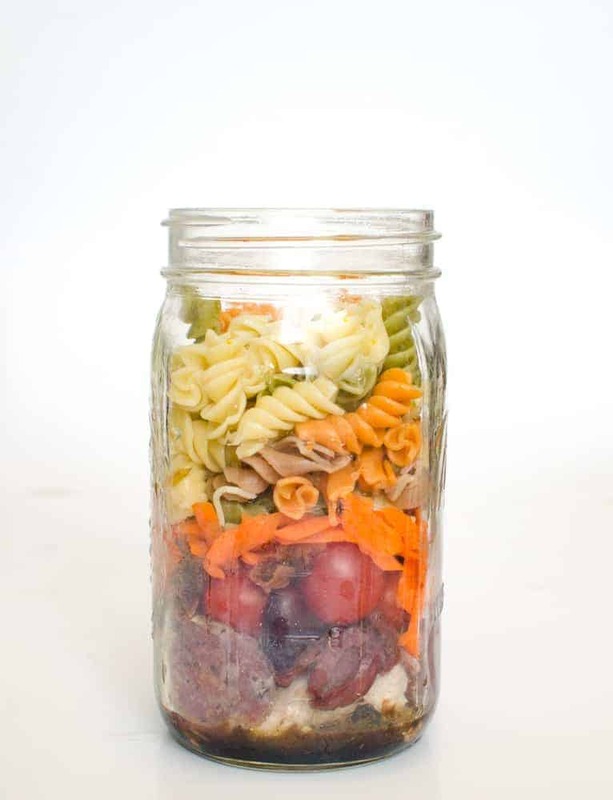 I wanted to include a tuna salad and a pasta salad in this round of salad in a jar and they turned out delicious! This is a fun change of pace. You can add some salad greens on top of the pasta if you’d like to add even more vegetables to this dish. This is hearty, robust, and meaty. It’s perfect for a dinner side or as a meal on it’s own. The day that I served this as a side (with some cooked chicken and roasted veggies), I added some sliced cucumber from my veggie box and feta cheese to my serving (my people don’t really like feta so I left it out of the initial prep day). You can get my balsamic vinaigrette recipe here and some great tips on how to cook chicken here. Add the cooked chicken and salami. Top meat with olives, cherry tomatoes, sweet bell peppers, and carrots. Fill up your jar with the cooked pasta. Screw on the two piece lid (flat and band) and store in the fridge for up to a 3 days. You can get my balsamic vinaigrette recipe here and some great tips on how to cook chicken here. Why I love this salad: Because it has all the veggies! This is a great clean-out-the-crisper salad because it has a little bit of everything in it. You can add or take away anything you’d like; it’s very flexible. This doesn’t have any protein added, so it will last up to 7 days in the fridge. This would be great with the addition of some beans (which you could add when prepping the salad) and or some chopped ham, boiled eggs, or cheese that I would add the day you serve it. All of those are extra, but would turn this salad into a meal fit for a queen/busy mom. You can find my ranch dressing recipe here. Add the radishes, then broccoli/cauliflower, red cabbage, bell peppers, mushrooms, and carrots. This would be great with the addition of some beans (which you could add when prepping the salad) and or some chopped ham, boiled eggs, or cheese that I would add the day you serve it. All of those are extra, but would turn this salad into a meal fit for a queen/busy mom. You can find my ranch dressing recipe here. Why I love this salad: I’m always looking for new ways to get excited about eating tuna. I like tuna and I know it’s a pretty inexpensive/easy way to get in a lot of protein and healthy fats. This salad in a jar has a whole can of tuna, grapes (because I love fruit with tuna), veggies, nuts, and greens. It was awesome and I can’t wait to make it again. This salad need to be eaten within 3 days though, because of the meat. If you don’t have grapes, some chopped apples would work well too. I liked the whole crunchy almonds in this (though they do soften a bit with everything else), but sliced almonds would work too. You can find my dressing recipe here. Top the tuna with the grapes, bell peppers, carrots, and almonds. 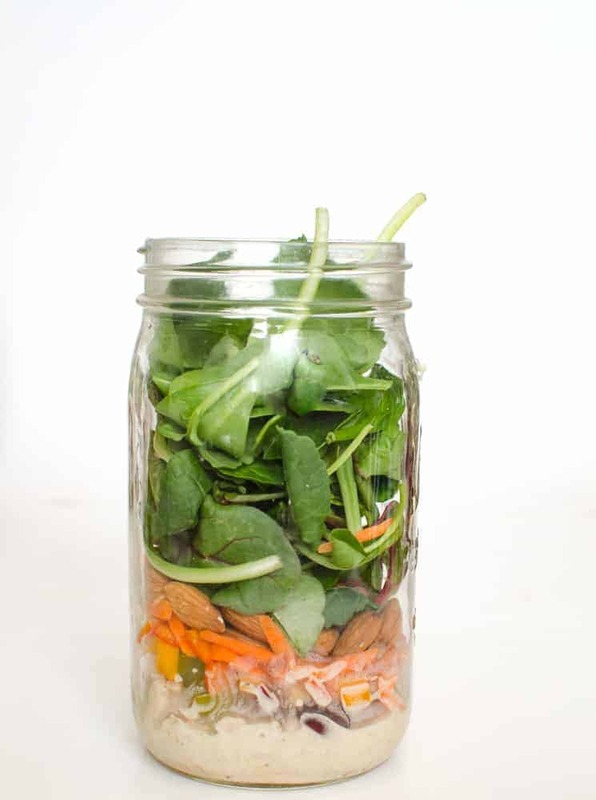 Fill up your jar with the salad greens. If you don’t have grapes, some chopped apples would work well too. I liked the whole crunchy almonds in this (though they do soften a bit with everything else), but sliced almonds would work too. You can find my dressing recipe here. Why I love this salad: Feta, olives, artichoke hearts… what’s not to love? The roasted chickpeas are delicious and a lot of fun too. Because there is no meat in this salad, it will last a full week in the fridge. The hearty feta cheese does really well like this! I like to exclude cucumber from this salad so that it lasts longer in the fridge, but oftentimes I’ll take some sliced cucumber from my veggie box and add it to this when it’s time to serve it. I really like these strong flavors though my family likes them less than I do. Making a few salads in a jar for my lunches during the week means that I can open and enjoy a whole can of artichoke hearts without wasting any! To make the roasted chickpeas, simply open a 15-ounce can of chickpeas and give them a drain and rinse. Then toss them with your favorite spices and salt and roast for 15-20 minutes at 400 degrees. They are delicious right out of the oven! I used the same chickpeas in this salad as well as the taco salad recipe, so I roasted the chickpeas in salt, pepper, cumin, and smoked paprika (just a hearty shake of each). These flavors went well with both salads. You can find my vinaigrette recipe here. Add the olives, artichoke hearts, tomatoes and feta cheese. To make the roasted chickpeas, simply open a 15-ounce can of chickpeas and give them a drain and rinse. Then toss them with your favorite spices and salt and roast for 15-20 minutes at 400 degrees. They are delicious right out of the oven! These flavors went well with both salads. You can find my vinaigrette recipe here. It’s so nice to open up the fridge and see something healthy ready to go. The funny thing about having things prepped and ready is how often my kids want to eat them. It’s a common mom fact that the things you don’t want your kids to eat/the things you make just for you are the exact things they do want to eat. So make these for you and enjoy it when your kids beg for some of your salad. Hooray for making good choices so that you can make cookies on Friday after school with the kids and not feel bad about it. It’s all about balance friends, and I hope this helps to brings more peace and vegetables to your life. I had forgotten how good jar salads are. Thanks for posting some I have not tried. I go through cycles of not doing them too and I’m always happy when I come back to it! These were some really tasty ones. ENJOY friend! 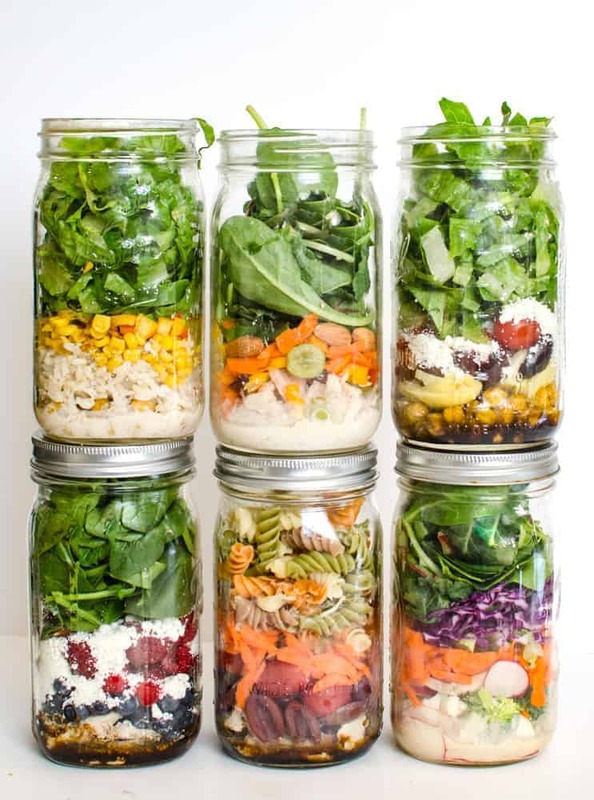 I want to fill my fridge with these colorful jars ~ great tips and a fabulous post!